It’s not a very long list. Nathan Peterman’s NFL career, to date, has been a confluence of worst-case scenarios. As a rookie, he was leveraged to push a perfectly good starting quarterback out the door in hopes of jumpstarting a new era of half-assed rebuilding. As a sophomore, he was appointed the leader of the league’s saddest quarterback race, then tasked with keeping a warm seat for 2018’s most divisive QB prospect. 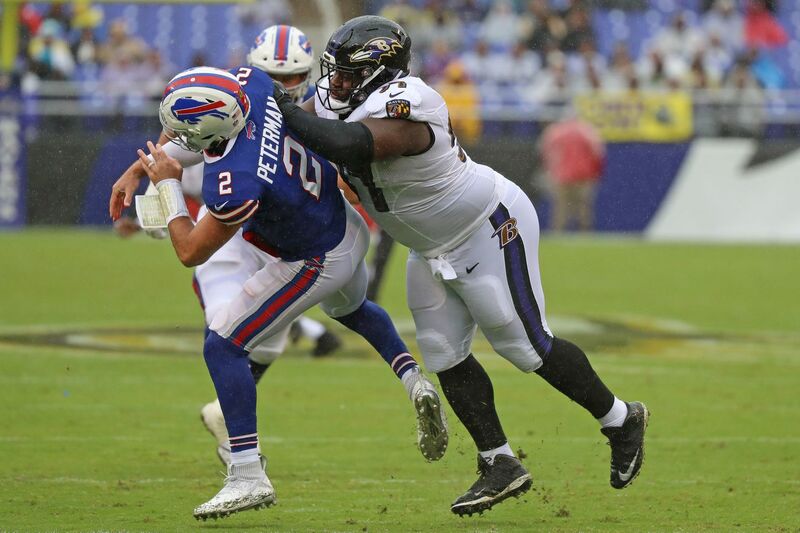 When Buffalo sees a problem, its solution is to throw Peterman at it, regardless of whether he’s ready or capable of handling it. If the Bills were stuck in an escape room, head coach Sean McDermott’s solution would be to hurl Peterman’s lifeless body at the locked door for an hour. The second-year quarterback has been forced into three starts with the club. He’s finished exactly none of them. And now, it looks like he won’t get the chance for a fourth — for a while at least. b) spiking the ball into the turf 40 times per game would still net a 39.6 rating. But it wasn’t all bad for Peterman. Here are the moments upon which Bills fans can fondly reminisce. 2. Peterman’s garbage-time performance vs. the Saints convinces Buffalo he’s the future. The Bills got absolutely crushed as part of the Saints’ 2017 revival, but the defeat gave Buffalo a glimmer of hope when its 23-year-old backup quarterback assumed mop-up duties with five minutes left in a 47-3 game. Peterman completed five of his six passes on his team’s final drive of the day, leading the Bills 75 yards to cut the New Orleans lead to a mere 37 points. His touchdown pass to Nick O’Leary wasn’t easy, but it did delight the remaining 45 fans at New Era Stadium who had not yet absconded to the parking lot to throw their fellow tailgaters through tables. Peterman would follow up this showing by making history the following week. Not in a good way, mind you. A Tyrod Taylor knee injury meant the Pro Bowl quarterback the Bills’ Week 14 showdown against a Colts team that would finish its season with three wins. Buffalo was 6-6 and clinging to the periphery of the playoff race, hoping to break a postseason drought that haunted western New York through the beginning of a millennium. The football gods, smiling upon them, dumped a foot of snow on Orchard Park and washed their hands of the whole ordeal. Rising from their indifference like a phoenix made of Arby’s wrappers and Steel Reserve, was Peterman. His 8-yard touchdown strike floated over the heads of two Colts defenders and into the hands of Kelvin Benjamin to give the Bills a 7-0 lead. One quarter later, a jarring hit would knock Peterman out of the game, leaving third-stringer Joe Webb to finish off the victory that would help send Buffalo to the playoffs for the first time since 1999. Godspeed, Nathan Peterman. We’ll see you again once Josh Allen sails four straight passes over the head of his check-down tight end in December.